Work at Macca's? Stay up to date. McDonald’s have committed to commence bargaining for a new McDonald’s Agreement. Your McDonald’s Agreement sets out your pay and conditions at work. The SDA is the union for workers at McDonald’s and negotiations have now commenced. 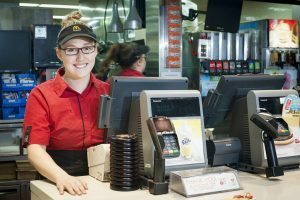 SDA Organisers have visited McDonald’s stores across the country to get your views about important workplace conditions. Your feedback formed a Log of Claims we took to the Company at the start of negotiations. Register your support and to receive updates throughout the bargaining process now. Yesterday the SDA met with McDonald’s to start negotiations for a new McDonald’s Agreement. Before negotiations, we spoke to SDA members and surveyed McDonald’s employees across the country about important workplace issues. We used your feedback to compile a list of issues and conditions to form a Log of Claims. The SDA presented this Log of Claims to the Company yesterday and bargaining has now commenced. We will continue to keep SDA members up to date with the latest news from negotiations. SDA Organisers have been out in stores talking to McDonald’s workers about your pay and conditions. Before any negotiations for a new McDonald’s Agreement begin, we want to hear from you. If you haven’t taken our survey in store, get in touch with your local SDA Branch. Let us know what’s important to you so we can take your feedback when negotiations with the Company begin. We will keep you updated throughout this process. Further technical steps have been completed this week to commence bargaining. The Notification of Employee Representational Rights (NERR) has been issued which is the formal notice for commencement of bargaining. The SDA expects to start negotiations with the Company for a new McDonald’s Agreement soon. As the union for McDonald’s workers, the SDA will represent you in negotiations with the Company. Securing a new McDonald’s Agreement is the best way to secure your pay and conditions going forward. Before any negotiations begin we will be surveying members about what you want in your McDonald’s Agreement. We will then take your feedback to form a set of claims (log of claims) to take to the Company. Remember, having your say is important.